We are a culture of busy. It’s all you hear some days. “I’m too busy to get the sleep I need.” “I’m too busy to go out with my friends for a drink.” “I’m too busy to read.” It might even be something that comes out of your own mouth regularly. I get a lot of questions about how I manage to make the time to have a yoga practice or how I fit in exercise. Aren’t I busy too? After all, I work full time out of the house, I have two elementary-aged kids, and I have a husband that I enjoy spending time with. Am I just magically creating a 25th hour in my day? NO. No I’m not. And yes, I am definitely busy. And just between you and me, lately I’ve been catching myself saying that I’ve been too busy to fit in my yoga. I’ve been too busy to meditate. Too busy to do even short workouts. Too busy to read the book I’ve got on the go that is SO captivating. Just too busy. Except the thing is I’m not. I do have to go to work, and I do have kids to love on, and I do have a husband that I want to hang out with watching movies. However, I am not busy every second of the day and I can find the time for the things I need to take care of myself. I’m just spending too much of that time reading Facebook and tweeting and YouTube watching, and otherwise goofing off. Those things are fine. They’re fun. The truth is, though, if I have enough time to refresh Facebook for the elventy-fifth time and to complain that no one has updated then I surely have enough time to throw down a HIIT workout or to do some yoga to unwind. I don’t have reasons, I have excuses. The valid reasons (my job, my family) are not what is getting in my way. The excuses are. I have to teach a module for a training course at work tomorrow and I can tell you right now I’m wishing I had made time for more yoga and meditation lately. It would have been a really good idea for calming my nerves. I know I’ve got an arsenal of tools for taming anxiety but regular yoga would have kept me cool in the days leading up to it too. I’m tired of my own excuses. 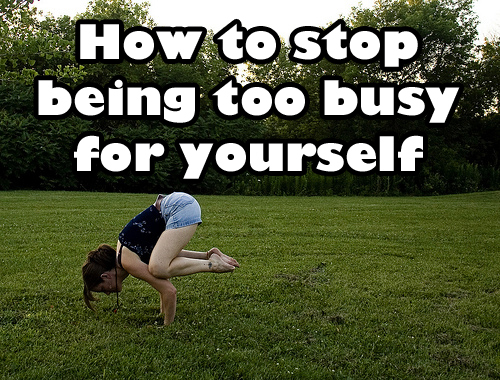 It’s time to stop being so BUSY all the time. Schedule the things you need. We’ve all seen articles telling you to schedule dates with your partner. The same works for you. Make a date with YOU to unroll your yoga mat, to hit the gym, to get your nails done. Whatever it is that feeds your soul that you’ve been neglected needs to be written in on your calendar. Treat yourself like an appointment and stick to it. You’ll never magically find the time. MAKE it. Let go of the guilt. I realize that you might momentarily feel bad about running off to the yoga studio when you haven’t even gotten home from work yet or that you may worry about your kids feeling left out if you lock yourself in your room to meditate. Just remind yourself of the airplane analogy. You can’t put someone else’s oxygen mask on if you haven’t taken care of your own. Take care of YOU so you can take care of THEM. They’ll probably appreciate the happier, calmer you. Multi-task. I am terrible for making time to meditate even though I know it’s so good for me. Luckily I commute to work by bus so I can put on a guided meditation and listen to it while I’m sitting in traffic. It’s certainly more productive than huffing over how long the drive in is taking! What can you do? Can you get moving by dancing up a storm while you do housework? Have you asked your kids to join you with some living room yoga? Make sure you do things you enjoy. I love HIIT workouts. I think they’re a great, effective way to work out without taking up too much time and I can do them at home. You may hate them. So don’t do them! Find something that you enjoy that makes you smile. If you hate primping don’t book a manicure. Schedule soul-nourishing activities that will make you happy. You’re more likely to stick to them. How about you? What are you having trouble making time for? What thrills you to the core that you keep putting off because you’re too busy? Let me know in the comments! I’m working on a series of videos and blogs to help you fit in what you need and I’d love to hear some of your challenges so I can see what I can come up with for YOU. Hey! I almost forgot – make sure you sign up for my mailing list. You get a free stress guide tool and an exclusive video just for signing up, plus I will send you little happy notes and updates from time to time. There’s no charge, so come on in! Click here to sign up right away! I have found myself giving up on me time. I told my husband I wanted to sell off my books (even the ones I haven’t read) since I don’t see me having time for them. Even after losing my job, I find myself lacking motivation to make time for me. I spend it all on dealing with 4 kids, a husband, cleaning, errands, and yes… emails or Facebook. I think this post definitely shines a needed light on all we give up while saying we don’t have time!